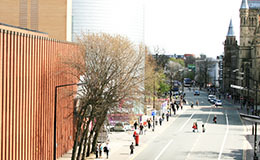 Meet our students and discover what they think about studying at Manchester. I will have a well-respected and well-rounded degree when I will graduate, and the unique amount of practical experience offered at Manchester is what will differentiate me from other graduates. In addition, the industrial connections in the School of Computer Science are invaluable. Kyriacos is currently spending his year in industry with Red Bull's Formula One Racing Team. Rebecca is studying a joint honours in Computer Science and Mathematics. Nicolae is on the Computer Science with Industrial Experience degree course.